This is what’s happening in my mom’s garden this week. 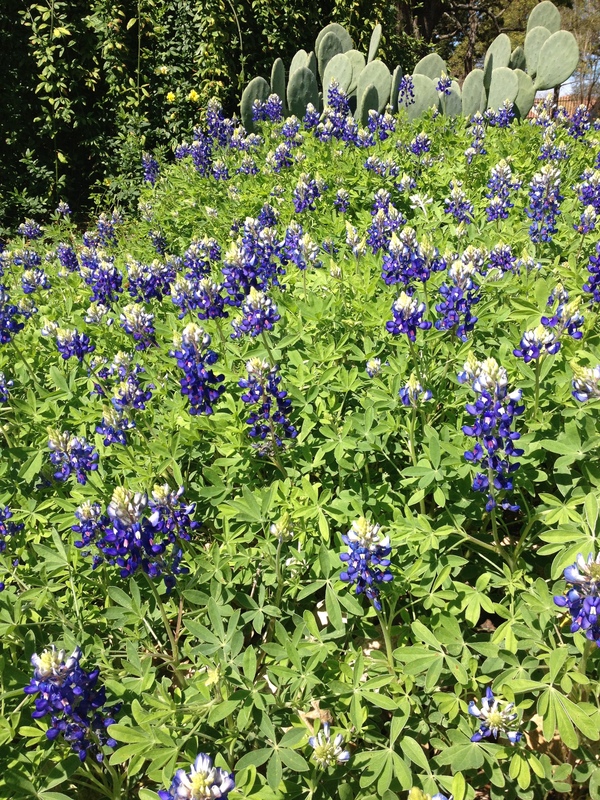 Spring in the Texas hill country is amazing. Someone shared a concern about the yoga sūtras with the group and she had a really different interpretation of the material than I did. Only it wasn’t a fully formed interpretation, it was a doubt, an inquiry. And I could instantly feel that this woman’s question threatened the whole foundation of my understanding of the yoga sūtras, which is also the foundation of how I’ve found healing and peace in my life, how I work with my yoga therapy clients, and what I have dedicated years of my life to learn. At almost the same time that the words were coming out of her mouth, I reacted. I saw this person’s questioning as a personal threat. I got really angry and I felt my dogmatic-inflexible tendencies emerge from my depths as if my anger and obstinacy could make what I believed more true and less susceptible to questioning. I had all these things running through my head: How could she think that? And that is wrong. And the answer to this question is so fundamental to what we are doing here that if you aren’t in, you’re out… but fortunately my reaction disorganized my thinking and I didn’t have the chance to blurt any of that out. Instead, I got to observe one of our teachers, Dolphi, sit there at the end of my row and not react. She didn’t seem at all upset by this inquiry and, as a matter of fact, she appeared to be curious right along with this other person. Dolphi knows the yoga sūtras intimately. She has studied and lived these ideas for decades. You can feel something special when you are in the room with her. So she could have busted out an awesome response to the question, but she didn’t bust out anything for a while. She just took the question in. She was unruffled, unthreatened, and compassionate. It was beautiful. There is no fear, no ego, no desire and no aversion. The mind is perfectly pure, translucent. Only the object of meditation shines, as if the mind no longer existed, because it is as if the mind has been emptied of its own identity. And that’s exactly what I saw that day in the classroom. No ego, no reaction, but a compassionate connection between two people. I want to be like that. Vulnerable enough to share doubts and comfortable, kind, and compassionate enough to hear and consider them. I’m thrilled have the opportunity to team up with Barbara Puett, our exceptional golf pro, to offer the upcoming class, YOGA FOR GOLFERS at Barton Creek Country Club in Austin, TX. I’ll be guiding students through a targeted yoga practice for relaxation, attention and flexibility. Barbara will help you skillfully apply these key elements to the short game and full swing. You’ll gain distance and power, body awareness, flexibility and tempo AND reduce tension. The workshop is great for those who already play and want to play golf. Barbara Puett is former state champion and six-time Austin City Golf Champion, as well as a best-selling author. Barbara is a beloved teacher and has helped hundreds of golfers at all skill levels enjoy the game of golf for over 15 years. it’s posts like this one that make me so glad i read you…your openness to the whole experience of what you view as your shortcomings, or moments of error…your openness to learning from the little stuff that often scares me to confront in my own life…it is all deeply inspiring. “No ego, no reaction, but a compassionate connection between two people” – I want to be like that, too.